A long standing abortion facility in Michigan, the Eastern Women’s Center/Women’s Center of Michigan has suddenly closed its doors with no apparent warning. Pro-life activist Lynn Mills came upon the announcement when looking at Google maps. Mills followed up by calling the abortion facility, located in Warren, where she was told by a staffer that the facility was closed and they were diverting patients to their Sterling Heights location. No other details about the closure were given to Mills. The facility was owned by Jacob Kalo, who at one time operated five facilities in the state. After selling his Lathrup Village facility this past summer, the number now stands at three. In 2o14, that facility, the Women’s Center of Southfield, had its license suspended for several health and safety violations, according to officials. The following year, an abortion patient from the Lathrup Village facility went public about her gruesome late term botched procedure and perforated uterus. 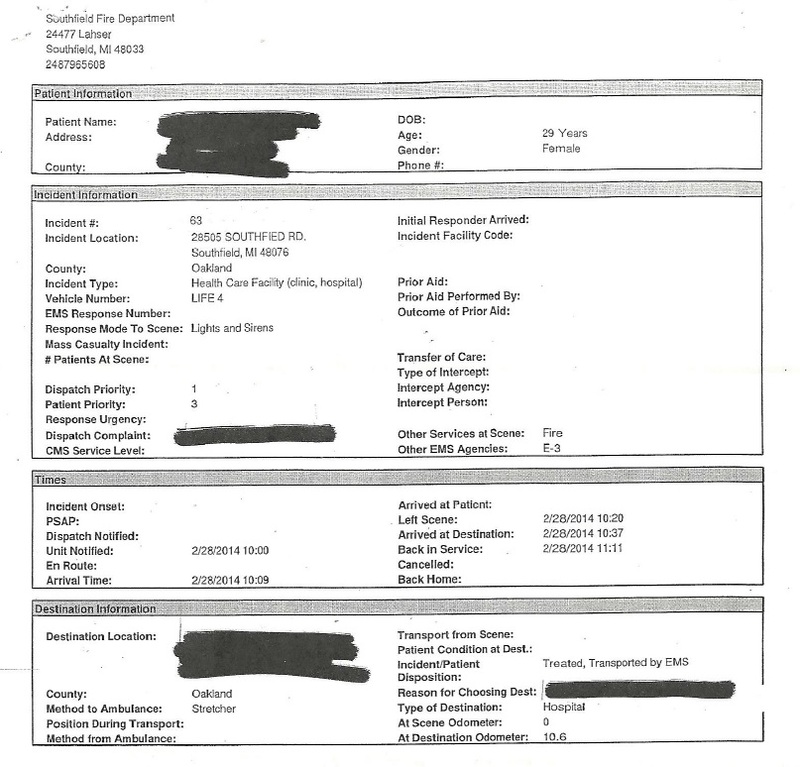 According to a 911 transcript obtained by Mills, the abortion was committed by Kalo’s contracted late trimester abortion doctor, Reginald Sharpe. The woman reached out to Mills and detailed during a national radio interview, how parts of her almost 24-week preborn child had been pushed through the uterine perforation, and the abortionist was having difficulty removing them. Mills told Live Action News that the woman recounted how the abortionist had been training another doctor to do the later term procedure that day. The woman stated in a radio interview, “And I saw this red bucket on the floor and – uh – what I saw was just….” The woman, unable to continue, had seen her dismembered baby, explained Mills. Mills told Live Action News that the Warren facility building had been up for sale for several years. Pro-lifers outside Kalo’s facilities have had interesting interactions with the abortionist. Mills regularly warns patients outside the facility about the abortionist, and according to the abortionist himself, numerous women have come forward with complaints about him since pro-lifers began warning patients with signs (shown above). In the video below, Kalo claims the accusations are false. Mills said Kalo’s facilities were recently licensed by the state, which enacted regulations only a few years ago. But Kalo has been able to operate his facilities regardless, while awaiting inspections. “He’s most likely cutting his losses now,” Mills said. 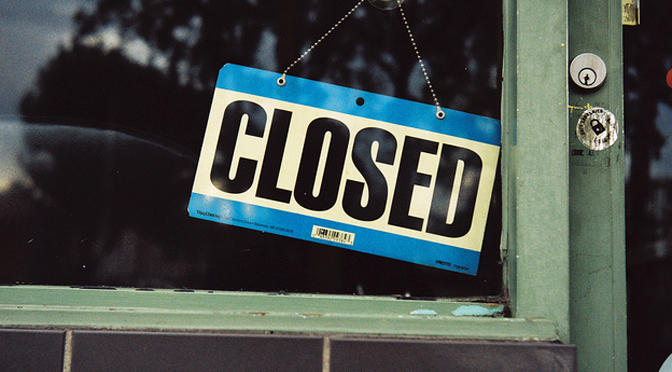 Shortly after the state passed clinic licensure regulations, Mills claims over a dozen abortion facilities closed rather than face the occasional (every three year) inspection by regulatory officials. “This is just another victory for pro-lifers and babies,” Mills stated. This article is reprinted with permission. The original appeared here at Live Action News. An abortion clinic in the State of Michigan which lost its license to operate for failing to pass basic health inspections may be given the chance to reopen. Abortionist Jacob Kalo currently operates four abortion clinics in Michigan. On November 21, 2014 the state closed a fifth abortion facility after the state suspended the license of Kalo’s Women’s Center of Southfield for failing to pass several health inspections. 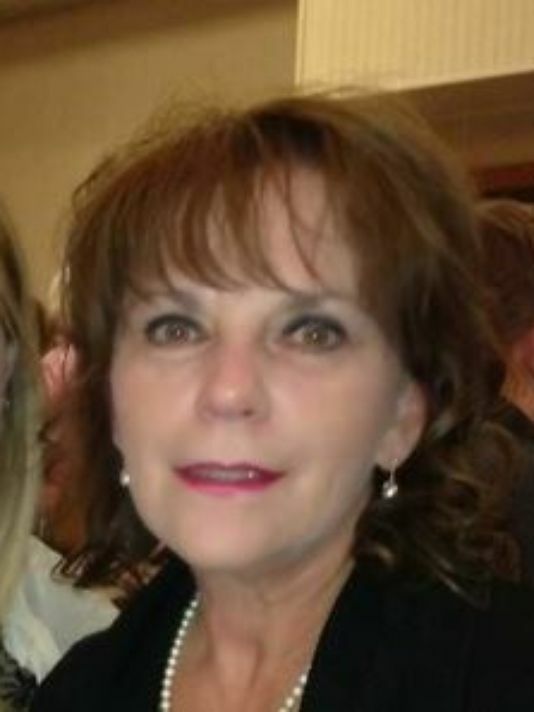 According to pro-life activist Lynn Mills, who has researched Kalo’s record, the abortionist took over the Southfield abortion facility from troubled abortion provider, Abraham Alberto Hodari. Under Hodari the facility was one of only a handful of abortion clinics in the state that held a license. In just over one year of taking over the clinic, Mills said Kalo’s Southfield facility failed to pass several state inspections. 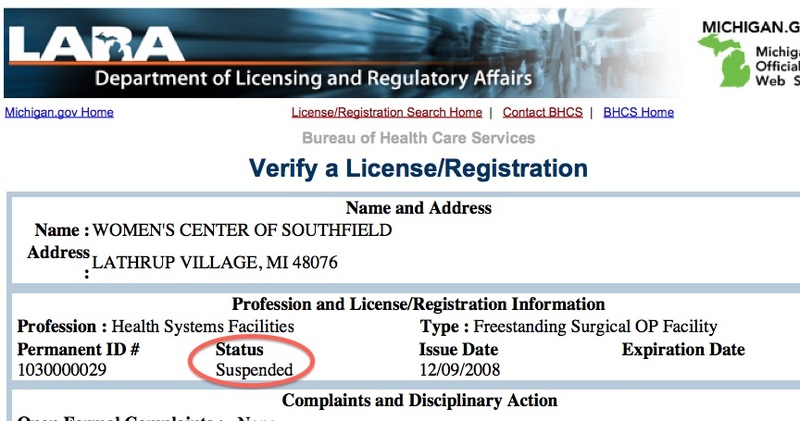 As a result, in 2014, the state suspended the license of the Southfield clinic with the goal of a permanent suspension. • No inspection of the POC (Productions of Conception) was observed by Dr. Kalo or qualified person assisting the physician prior to disposing of the pathologic specimen by the medical assistant. • Patient’s belongings-purse, shoes, and clothing stored in an open plastic basket in OR during procedure. • During procedure the RN was observed going into the medication supply cupboard with contaminated gloves. The RN drew medication from a multidose vial into an unlabeled syringe and gave it to Dr. Kalo who administered it, without the RN showing him the vial for verification of medication provided. • No hand hygiene observed by Medical Assistant after removing gloves after washing dirty instruments used during the procedure. • Following the procedure Dr. Kalo was observed handling the bloody used suction tip and tubing in the instrument cleaning sink without gloves or proper PPE. Despite the serious violations, the state has now decided to allow Kalo’s Southfield abortion clinic to reopen. This news comes to Live Action News, in a document provided by Mills. According to the September 30, 2015 agreement issued to Kalo from the Department of Licensing and Regulatory Affairs, the state is dissolving it’s suspension of the abortion clinic based on a few stipulations. First, the order requires that Kalo pay the state $25,000. According to the Stipulations Agreement, the clinic will remain suspended until Kalo complies all applicable requirements of the Public Health Safety Code. The state is also requiring the Southfield abortion facility to pass at least one unannounced inspection. Then, if the clinic reopens it will be placed on probation for at least one year. “Kalo failed to maintain basic proper hand washing and hygiene requirements, that alone should set off warning flags and alarm everyone,” Mills points out. Although the document says that the state is requiring that Kalo’s other four abortion clinics be inspected, Mills said that since the law requiring abortion clinic inspections and licensing went into effect in 2013, the state has yet to inspect those facilities. To date, Mills said that the Southfield clinic remains closed. UPDATE: Since publishing this blog, Jessica’s mom has contacted Saynsumthn, she has stated that she has not changed her opinions on abortion as stated originally. Saynsumthn reported what Jessica said in her public interview but in fairness is adding this disclaimer along with the mother’s comments (below) to the post. A woman whose abortion at 23 weeks landed her in the hospital spoke out recently about her regret and the harm her decision has cost her. Jessica D. was interviewed by Al Kresta along with pro-life advocate Lynn Mills. Jessica met Mills after she saw a comment Mills posted on this blog. The hour long interview was emotional and full of details which may disturb some readers, be warned. Jessica was married and had a disabled child when, in February of 2014 she and her husband made the decision to have an abortion. She said that when she found out she was pregnant- she was panicked. “When you’re in panic mode you don’t think – you don’t have emotions to fix things,” she told Al Kresta. Jessica recounted how her mom had worked for Planned Parenthood years before she decided to have her abortion. She thought her mom, who remained relatively silent when she contemplated the decision to have an abortion, was supportive. But after she had the second trimester procedure Jessica said that her mom shocked her by asking why she did not place the child for adoption instead. “I grew up in a very pro-choice home. We were not very religious and pro-lifers were crazy – that lie and nothing is the truth and they stretch the truth and you can’t trust it,” Jessica said. Although Jessica mentioned her pregnancy to her mom who was not employed by Planned Parenthood at the time, she was not involved in her ultimate decision to have the abortion. In February of 2014, Jessica went to the offices of abortionist Jacob Kalo who set up an appointment for her to see another abortionist, in Lathrup Village, his name was Reginald Sharpe. 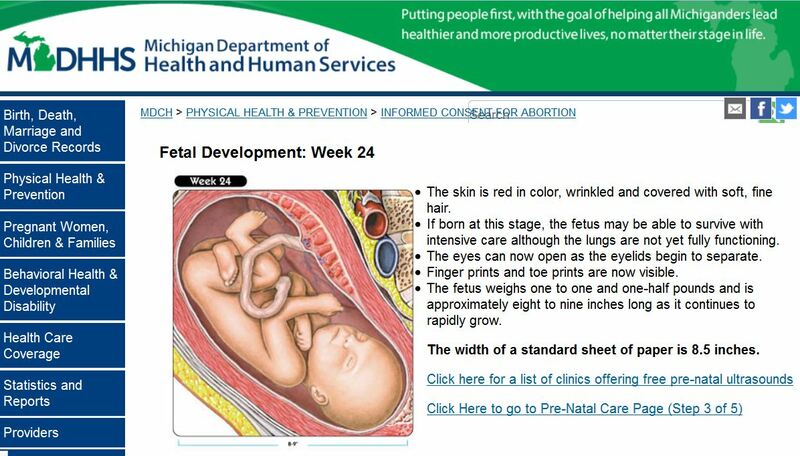 Jessica was 23 weeks and 5 days along just under the 24 week limit in Michigan. Jessica told Kresta that she was not given any counseling by the abortion clinic. “It was just a price given,” she stated. Jessica said the abortionist then gave her advice on how to get a second mortgage on her house or car. Jessica said she was not shown any fetal development pictures as well. Michigan state law requires an informed consent before an abortion can be performed. In most cases abortion minded women would be able to review informed consent documents online prior to the procedure. But in Jessica’s case, even though Planned Parenthood did not perform the abortion, she was able to go to them to review the informed consent package. 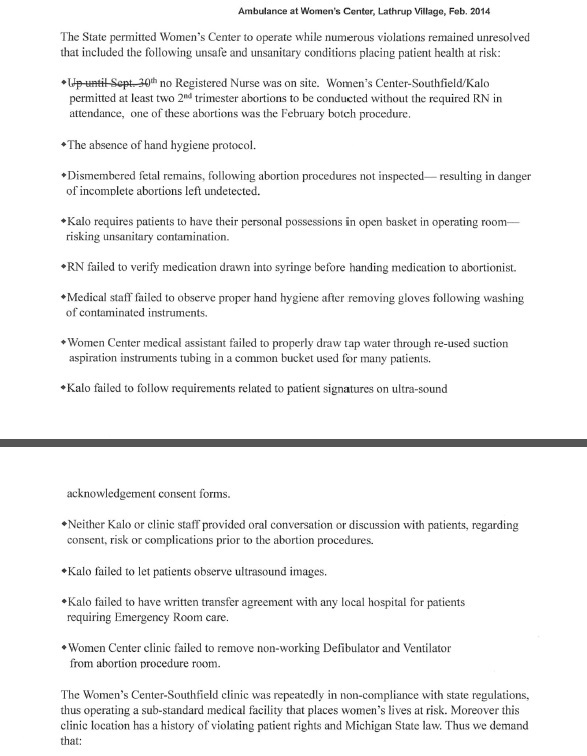 A written summary of the abortion procedure she will undergo. Depictions, illustrations or photographs of fetal development corresponding to the gestational age nearest the probable gestational age of the woman’s fetus. “Its like you’re not even human,” she stated. The abortion was a two day procedure. The first day, Jessica said that she received an injection of digoxin and her overall visit to the clinic lasted about twenty minutes. Digoxin is a drug injected into an unborn baby to cause his or her heart to stop in preparation for what amounts to a stillborn birth. It was very painful, Jessica reiterated. Because the pain was so acute, Jessica’s husband called the abortion clinic’s emergency number and they told her under no circumstances to go to the emergency room. Jessica said that on day two she was not given any pain medication for the procedure. “I was told I would have medications and fluids…I was expecting sedation and medication,” she said. She recalls that after forty-five minutes the abortionist had to stop to call 911 due to a perforated uterus and massive blood loss. “When he did perforate my uterus, I had sat up,” she said. What happened next will remain ingrained in Jessica’s mind forever. She continues, “And I saw this red bucket on the floor and – uh – what I saw was just…” at that point in the interview Jessica could not say it, but Mills explained that what Jessica saw was her dismembered baby. “It was so painful,” she said. Jessica told Kresta that while she lay there bleeding she felt that it would be better if she would just die. According to Jessica, parts of her almost 24 week unborn child had gone outside the perforation and the abortionist was having difficulty removing them. 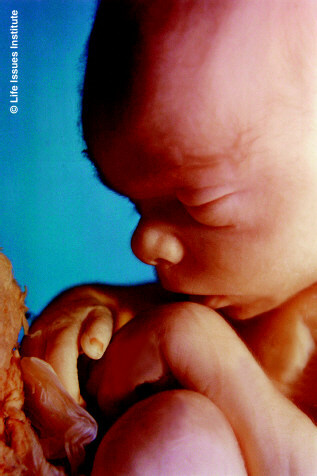 She told Mills earlier that the abortionist had been training another doctor to do the later term procedure that day. While Jessica waited for the emergency responders, she said the doctor changed his clothes and “Swiffered and cleaned up. Then, they placed an IV for the EMS people and kind of scrambled around.” She remained unclothed during this time, she stated. You can read that here. According to Mills, after the EMS techs arrived, the abortionist would not allow them to take her out the front door. She was removed out the back door which made the transfer more excruciating for Jessica who was already in pain. Jessica said that prior to making the decision to have the abortion, she had no expectation that anything would go wrong because everything she read online said it was a simple and safe procedure. As a result of the botched abortion, Jessica had to remain hospitalized for several days. Jessica said that days after she was released from the hospital she began to realize just what she had done in having the abortion. She said she began to look up information online to try and discover why her experience was so unlike what she had read about regarding abortions generally. Jessica said the abortion put incredible strain on the marriage. “I had actually had a suicide plan at that time things were so low,” she said. According to Jessica, meeting Lynn Mills was her last effort to make sense of what had happened. Mills said that Jessica found her online after reading a post at Saynsumthn’s blog (here) and got Mills’ e-mail address from the comment she had left for another abortion patient. Mills is helping Jessica work through the pain and regret of the abortion. Jessica said that she is planning to get counseling for the abortion as well as her marriage. She is working on forgiving herself. According to Mills, the state of Michigan has since suspended the license of the abortion clinic. Jessica and Mills have become friends and Jessica said Mills is someone she can tell everything about this experience to without judgement. “I want pro-lifers out there to really be kind and loving to my friend Jessica…All I want to do is love her- just love her and get her healthy. Jessica doesn’t want this to happen to anyone else,” Mills said in closing. Jessica said that her mother has actually changed her position on abortion as a result of what she experienced. Mills encourages pro-lifers to go out to abortion clinics as often as possible to try and reach the Jessicas who might be considering ending their child’s life. Jessica knows that telling her story will anger some people. She said she came forward because she wanted others to know they do not have to go through what she did and to seek help not abortion if you are a women in a crisis pregnancy. A woman who will be testifying at a press conference outside a Michigan abortion clinic got her courage to come forward after reading this blog. Pro-lifers will call for a permanent end to a Lathrup Village abortion clinic when they gather in front of the Women’s Center of Southfield on Tuesday. The clinic is owned by abortionist Jacob Kalo and abortions are performed by abortionist Reginald Sharpe. 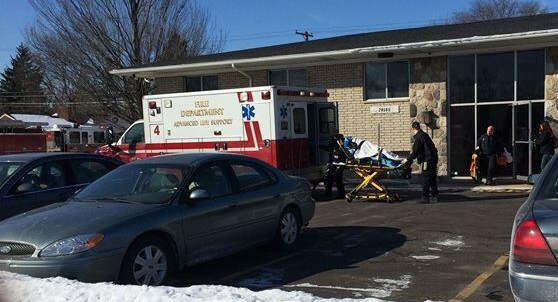 In 2013, this blogger posted this story: Ambulance removes woman from Michigan abortion clinic, detailing an ambulance being summoned to the Summit Medical Services abortion clinic in Detroit, where Reginald Sharpe worked at the time. At the time of that Blog post, Sharpe had been sued at least five times. The patient, who was injured from the abortion Sharpe performed on her, stumbled onto the Saynsumthn’s blog post. Although the woman did not leave a comment herself, she responded to the e-mail address of a local pro-lifer who put her in touch with local pro-life investigator Lynn Mills. Mills told Saynsumthn, that because she stumbled onto this blog- she is now willing to testify before the state about the treatment she received while under Sharpe’s care for an abortion at Women’s Center of Southfield. According to Mills, the abortionist perforated the woman’s uterus after she went to him for a 23 week and five day abortion. Mills said after the botched procedure, the woman was removed from the abortion clinic out the back door by ambulance. Mills has a recording of the 911 call placed at the time the ambulance was called, which she hopes state investigators will listen to in deciding whether to allow the clinic to continue operating. Unidentified female caller: He’s like, hold for one moment. I’m like what are you talking about? Unidentified female caller: I’m calling from WomanCare of Southfield. We have a patient here who needs emergency assistance to the hospital. We were doing a termination of pregnancy and there’s possible complication. Receiver: Ok, female, how old? Receiver: Ya, how old? How old? Unidentified female caller: She is 29 years old; she’s a female. Unidentified female caller: She needs to go to the hospital like as soon as possible. Immediately. Abortionist Reginald Sharpe: This is Dr. Sharpe, how are you doing? Receiver: Good. We’re going to get the paramedics coming that way. I’m just asking the questions and we’ll get them coming to 28505 Southfield, ok? Abortionist Reginald Sharpe: We need them right now, she has a hole and she’s bleeding. Receiver: Ok, gotcha. We’ll get them coming. Abortionist Reginald Sharpe: Ok, about how long do you think? Receiver: As soon as I hang up on with you will get them coming that way, Doctor. Bye-bye. According to Mills, the woman had to be hospitalized for several days as a result of her abortion. Mills said the state Attorney General has since ordered the closure of Sharpe’s Woman’s Center of Southfield pending the outcome of an investigation. However, despite this, calls made to the clinic have confirmed they are open and scheduling abortions. “I kept writing the state asking how many times do they get to fail?” Mills said. Mills said a hearing is expected in March.